Like his namesake, this Richard also started his career at WWT Slimbridge before moving north to WWT Caerlaverock. Richard Smith spent two years on the avicultural staff at Slimbridge and three years as a Reserve Warden at Caerlaverock, contributing to research on whooper swans and barnacle geese. Along with other Richard and Liz Mackley, he has been on an expedition to Iceland to research whooper swans. 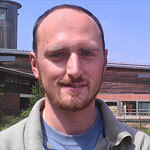 Most recently he has been leading a team of 12 jobseekers in conservation work for Wiltshire Wildlife Trust. He spends much of his time outdoors, birding, kayaking and surfing.